For the past few months I’ve been working on writing a booklet for Vineyard USA, edited by my good buddy Ramon Mayo, on the Lord’s Supper. As many of you know, I’m a huge advocate for the regular celebration of the Lord’s Supper. In fact, the inspiration for this booklet came when first wrote about five themes found in the Lord’s Supper. I’ve also talked about Calvin’s thoughts on the Eucharist as well as Ray Van Neste’s thoughts on the frequency of celebrating this sacrament. I’ve also made some brief suggestions related to a “kingdom-lensed” approach too. All in all, I have a very high view of Communion. Experiencing God is at the heart of the Vineyard. We regularly gather together in community to draw near to God as he draws near to us (James 4:8). Participating in practices that help form us into the image of Christ, our hearts long to encounter God! One way to experience God’s presence is by celebrating the Lord’s Supper. This booklet has been designed to help you experience God’s presence as you remember and celebrate the Lord’s death. 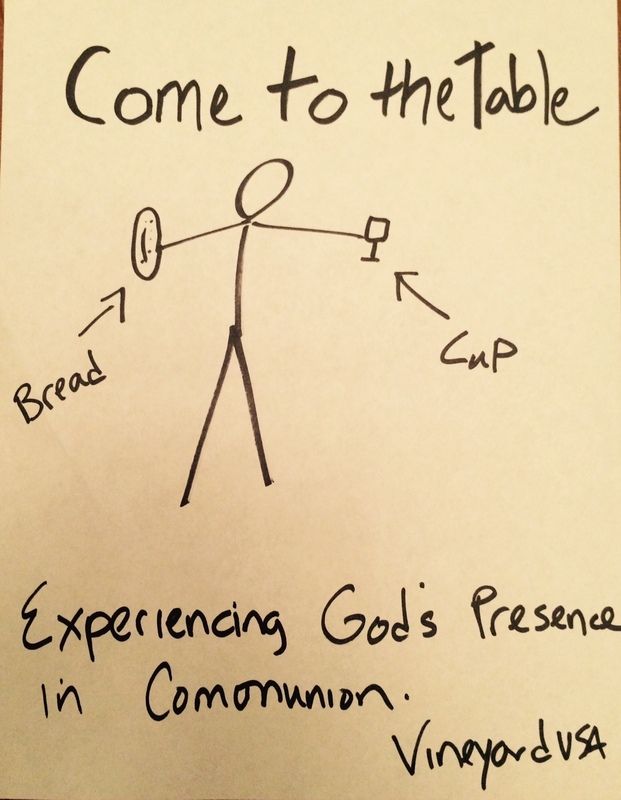 COME TO THE TABLE can be used for individual or group study or it can serve as a resource for a sermon series. In addition to the booklet, which you can order as an individual copy, an electronic copy, or in packs of 50 or 100, there are free sermon outlines available to help busy pastors (thanks to Joshua Hopping and Ramon Mayo for helping me with those!). I know I’m totally partial (because I love the Vineyard and I wrote these) but I just have to say that Vineyard USA did such an amazing job on the design and layout and all of that technical detail stuff. I would have probably printed it on white paper and drew some cartoon characters holding cups (see the picture to the right?). My prayer is that these booklets would be a blessing to God’s people, specifically those of us in the Vineyard movement (but not limited to those of us in the Vineyard movement!). I also hope that it helps serve as a resource for pastors/churches as they celebrate the Lord’s Supper. I love knowing that as we approach the Lord’s Table to receive the Bread and Cup, the Holy Spirit stirs in us a deeper sense of intimacy and brings to our hearts and minds a variety of truths that point us to God’s love.